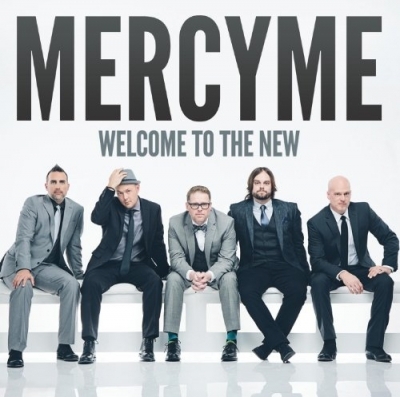 Grammy-nominated, American Music Award and Dove Award winning band MercyMe have released their eighth studio album 'Welcome To The New'. Collaborating with producers David Garcia and Ben Glover (TobyMac, Mandisa), the album represents a shift in tone for the multi-platinum selling group. Read More Grammy-nominated, American Music Award and Dove Award winning band MercyMe have released their eighth studio album 'Welcome To The New'. Collaborating with producers David Garcia and Ben Glover (TobyMac, Mandisa), the album represents a shift in tone for the multi-platinum selling group. I have to admit Mercy Me haven't always been my favourite band, that's not to say I dislike them. When growing up I spent more time listening to Delirious and Switchfoot over bands like Mercy Me. But this all changed once I heard their 2010 album 'The Generous Mr Lovewell'. The quality of that album was there for all to see. I felt like this was the first time the band really expressed themselves creatively. We then moved on to the 2012 album 'The Hurt & The Healer', which had so many good tracks and a very strong theme running though the album. This now leads us to the latest release 'Welcome To The New'. I really enjoyed this album, it is probably my favourite Mercy Me album to date. There is a real energy to this release that comes over when listening to the songs. So many of the tracks are memorable and catchy and you will want to listen to them time and time again. This isn't background music, this is much more direct and in your face than that. The album draws on many inspirations as well as moving with the times musically, pulling in many different styles to keep it flowing nicely. Second track 'Gotta Let Go' sounds like it's been pulled right out of the U2 Achtung Baby era. It sounds similar to the track 'The Fly', with a real grit and style to it. Then there is Shake which sounds like it was inspired by the 1940's musical era, with some great bouncing rock sounds coming out. Meanwhile, 'Greater' sounds like the band have been listening a lot to The Rend Collective. I'm not saying the band are copying sounds, instead they have taken inspirations and put them into their songs. There is a great theme running along the whole album, and it comes out none more so than in New Lease Of Life. It's great to hear a band feeling ready to create an album that gives them freedom. There is a true freshness to this album, I suppose this is why it's called 'Welcome To The New', it feels like the band are starting again. Musically it feels like a fresh start for the band. So if you think you know what this release might sound like, think again! Have a listen, I'm sure you will be very surprised and interested to hear what these guys have to offer. This band has been there, done that, and got the t-shirt on many occasions. Yet this album really does feel and sound different to anything Mercy Me have done before. As the band says, 'Welcome to The New'.